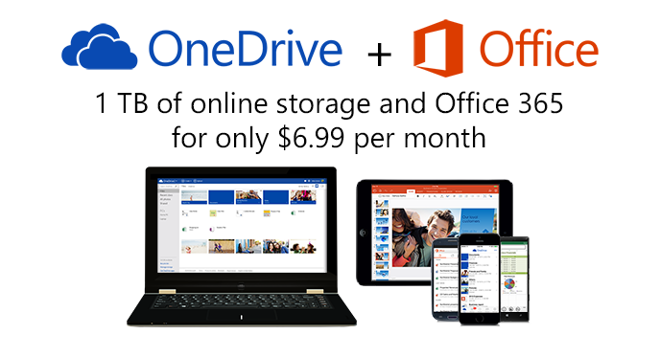 The latest shot in the cloud storage wars came on Monday from Microsoft, which announced a restructuring of its OneDrive offering that will more than double users' base storage allowance, as the software giant reacts to recent price cuts from rivals Apple and Google. Users will now start with 15 gigabytes of storage —up from 7 gigabytes —by default, a quota that Microsoft says should be enough for 75 percent of users to meet their storage needs without needing to pay. Jumping to 100 gigabytes will now cost just $1.99 per month, while 200 gigabytes moves to a $3.99 monthly subscription from $7.49 and $11.49, respectively. In a blog post announcing the moves, Microsoft program manager Omar Shahine said that the new pricing structure will take effect next month. Existing users will have their recurring charges adjusted automatically. Additionally, users with active subscriptions to the Office 365 service will see their allotment bumped to 1 terabyte per person. As traditional computers move to faster, lower-capacity solid state drives and mobile devices play a larger role in computing, cloud storage has become another battlefront for major software and hardware vendors. Google, for instance, announced similar price cuts for its Google Drive service in March. Apple has not been left out in the cold, unveiling iCloud Drive —a new Dropbox-style cloud file locker —at its annual developers conference earlier this month alongside less costly storage plans for iCloud. 20 gigabytes of space will cost users just $11.88 per year from the iPhone maker, with 200 gigabytes ringing in at $47.88 yearly. The only company that has not responded with cuts is nominal market leader Dropbox, which has not yet moved from its long-standing $99 and $199 yearly price points that yield 100 gigabytes and 200 gigabytes of storage, respectively. Dropbox appears to have eschewed price competition in the consumer space in favor of a strategy that would have it break rival Box.com's hold in the enterprise.